Overall Impression: This poem was pleasant enough. Per Bevington: This poem was published, along with his sonnets, without WS's permission. It takes the form of the Elizabethan poetic genre, the "complaint", in which typically there is a pastoral setting, rustic shepherds and shepherdesses, plaintive laments of deserted or unrequited lovers, etc. These complaints often bewailed moralistically the hazards of blind passion and might have been used didactically. This poem presents multiple points of view: the poet-narrator, the spurned maiden, the old shepherd, and the male wooer. 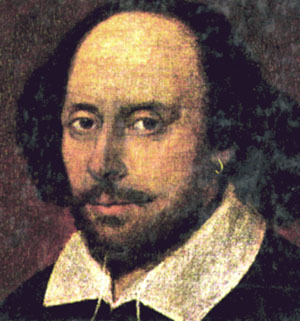 It portrays in rich metaphorical language the tense and bitter struggle between the sexes also seen in the "Dark Lady" sonnets. Line 1: The poet begins his tale of overhearing the distraught maid as she tears up letters, breaks rings, etc. She is still somewhat young in looks, despite her great distress. Her hair is partially disordered. 36 She throws love tokens, letters (some penned in blood), and rings drawn from her basket into the river. She cries out in tears about the falseness of her wooer. 57 An old shepherd, once himself a swaggerer and man about town, overhears her and descends the river bank to offer her a sympathetic ear and consolation. Line 177: Have some pity on my suffering. I have been called to love before without inviting it. I made past errors of blood (mere physical acts), not of the mind or of love. No woman has kindled in me such heart warming passion. 197 He shows her the love tokens and treasures other women have given him: diamond, emerald, sapphire, opal, etc. He is willing to give all these to her as one sacrifices at an altar. Here is a love token given him by a woman who had become a nun. She had rare beauty but rejected the suits of the men in court, at least before she met him. It isn't difficult to give up something that has not yet been tried. 246 After he came before her eyes, she wanted to give up her vows for his love--she who had wanted to be cloistered to remove herself from temptation now wanted to be free to venture everything for love. 264 Love is so powerful that neither vows, bonds, nor confinement cannot stop it. 274 The many hearts that other women have extended to him feel his heart aching because of her resistance, and supplicate her to give in. They also help to prove the credibility and truthfulness of his pledge of love. He looks down tearfully. Line 288: She stops quoting him and speaks her own thoughts. What witchcraft there is in a tear--even a rocky heart is worn down by a tear. His tears and crafty passion stole her reason and led to her loss of chastity. But afterwards his tears poisoned her, though hers had restored him. 302 He can assume whatever forms he wishes to accomplish his goals. No woman's heart can resist his determined assault. He disguised his lechery with talk of purity and chastity. 316 He concealed his inner fiendish self with an outer garment of grace. Who would not surrender to such a man? To receive again such pleasure as she experienced when she fell, she might fall again. 323 His infectious tears, his passionate cheeks, the forced thunder of his heart, his sad looks, all his affected passion could yet betray this penitent maid again.